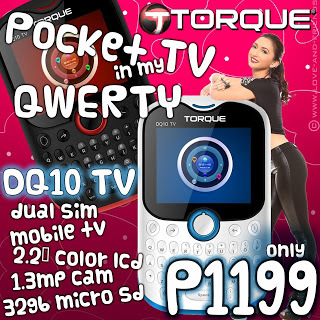 A new release mobile phone from Torque mobile, the Torque DQ10 TV. Main specification includes mobile TV, Dual SIM Dual Standby, 2.2 inch colored LCD, 1.3MP camera for Php1,199. Torque DQ10 TV is a basic mobile phone for the mass, affordable at the same time entertaining, at least for the mobile TV feature. DQ10 TV also has wireless FM and multimedia player. For Php1,199 and available now nationwide on Torque mobile stores, and authorized retailers. What can you say about DQ10 TV? Kindly share your experience with us!